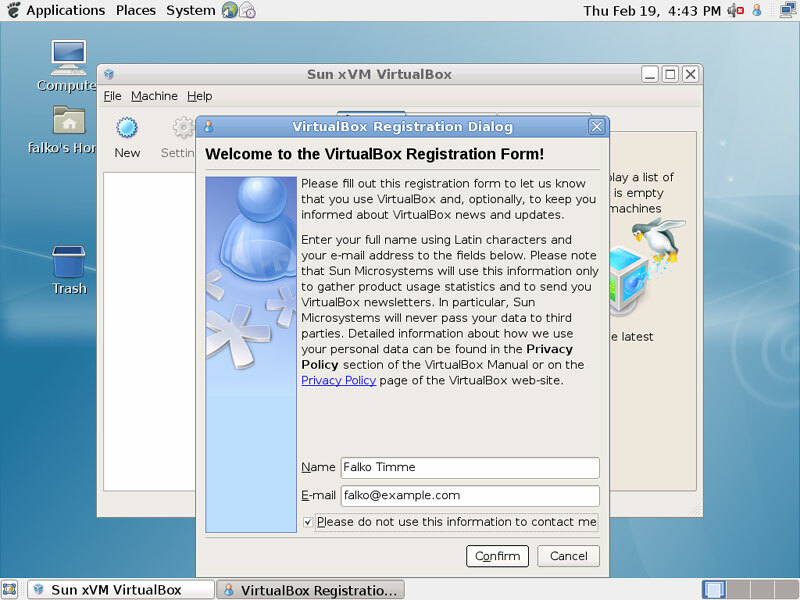 This tutorial shows how you can install Sun xVM VirtualBox 2 on a Debian Lenny desktop. VirtualBox is available as a package from the official Debian Lenny repository, but it's very old (version 1.6.6), therefore I explain how to install the current version (2.1.4 at the time of this writing). With VirtualBox you can create and run guest operating systems ("virtual machines") such as Linux and Windows under a host operating system. 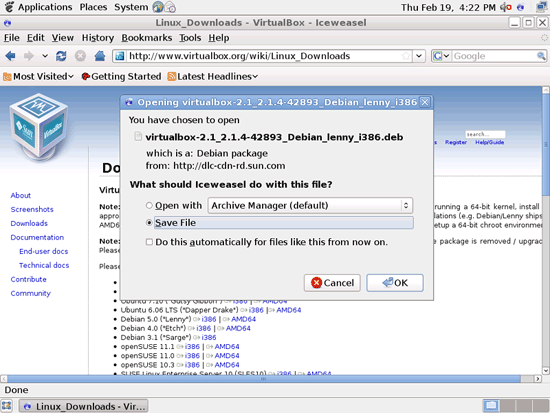 There are two ways of installing VirtualBox: from precompiled binaries that are available for some distributions and come under the PUEL license, and from the sources that are released under the GPL. 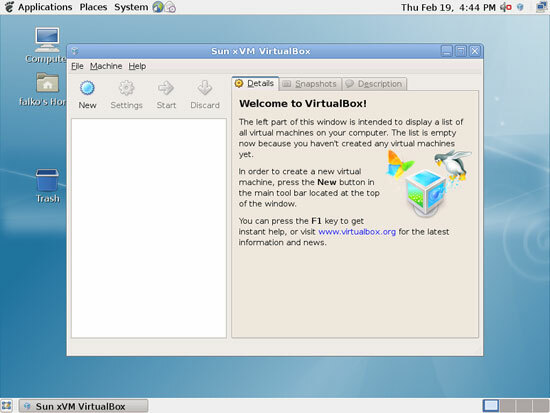 This article will show how to set up VirtualBox 2 (2.1.4 at the time of this writing) from the precompiled binaries. 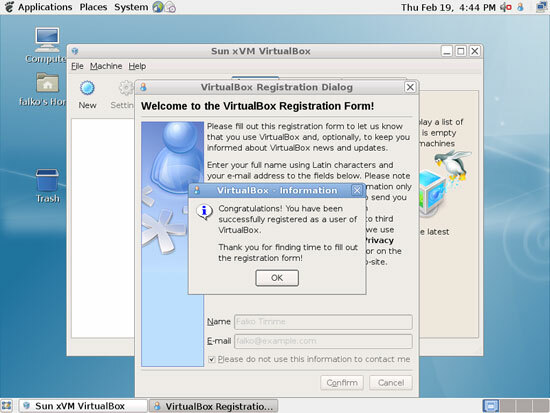 As of version 2 VirtualBox supports 32 and 64bit host and guest operating systems (if you want to install 64bit guests your processor must support hardware virtualization and, of course, the host operating system must be 64bit as well). 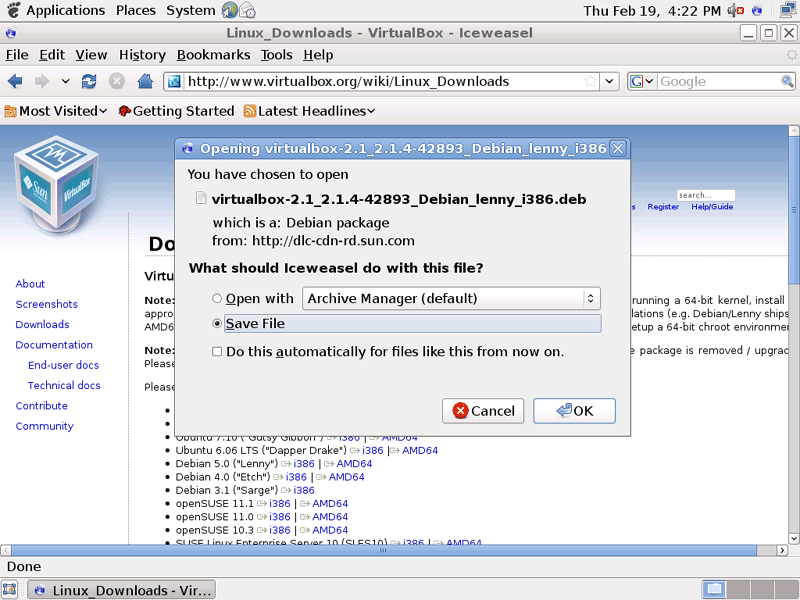 to install VirtualBox (make sure you use the correct path; also the package name can differ, for example if you have downloaded the amd64 version or if there is a newer version - use the TAB key to use autocompletion in the terminal). ... and close the terminal afterwards. I found these steps that will get your USB devices working. There is an easy workaround. Before starting the virtual machine, define /media as a shared folder. Then from windows explorer, map a network drive M: (for example) as \\VBOXSRV\media. You will then be able to access files on the USB memory stick at M:\disk. I am running VirtualBox 2.1.4 on Debian Lenny. 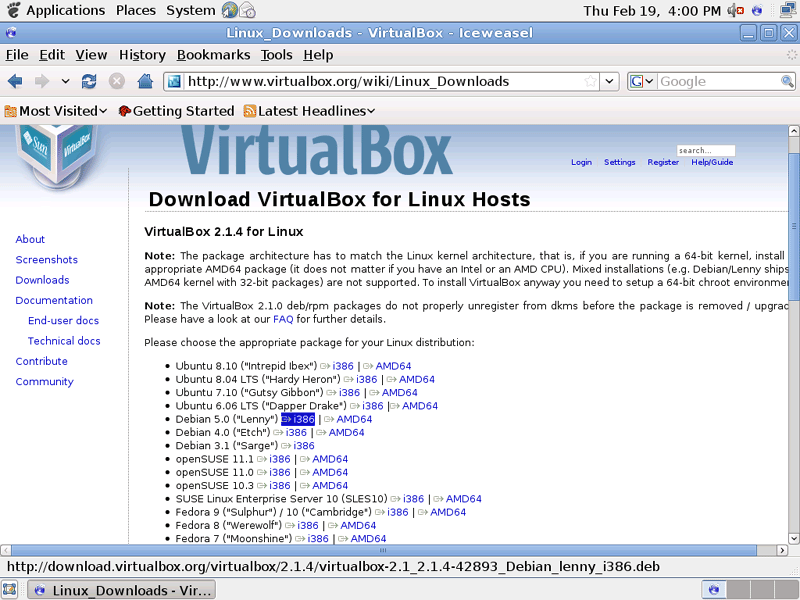 You don't need to download the Debian package from the Virtualbox's webpage first and then install it. 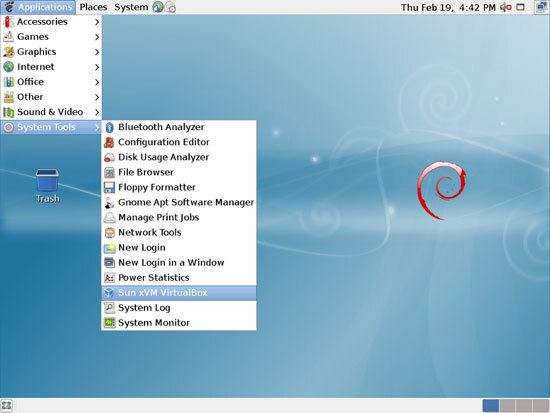 Virtualbox project maintains their own Debian repository and you can install Virtualbox using eg. Synaptic or aptitude. 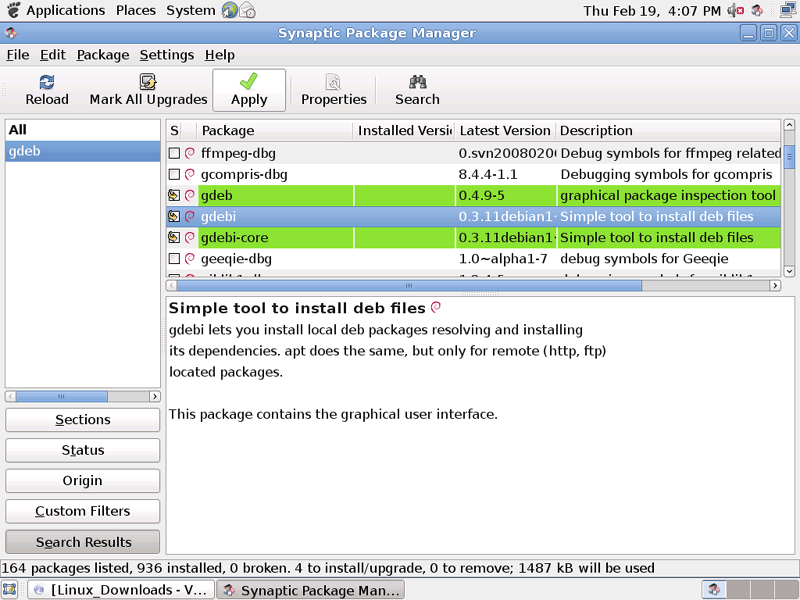 If you use the repository you will also get updates automatically when those are available. Save file and then close the text editor. Yes, it is true. 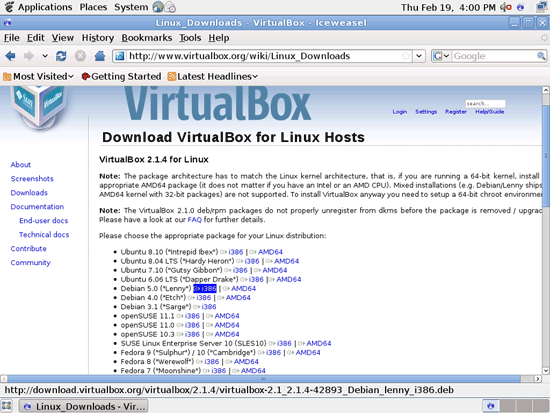 I installed VBox with this method. But VirtualBox is useful but only if you don't want to connect devices to the guest operating system. I mean a USB stick cannot be seen from the guest. These instructions are outdated. 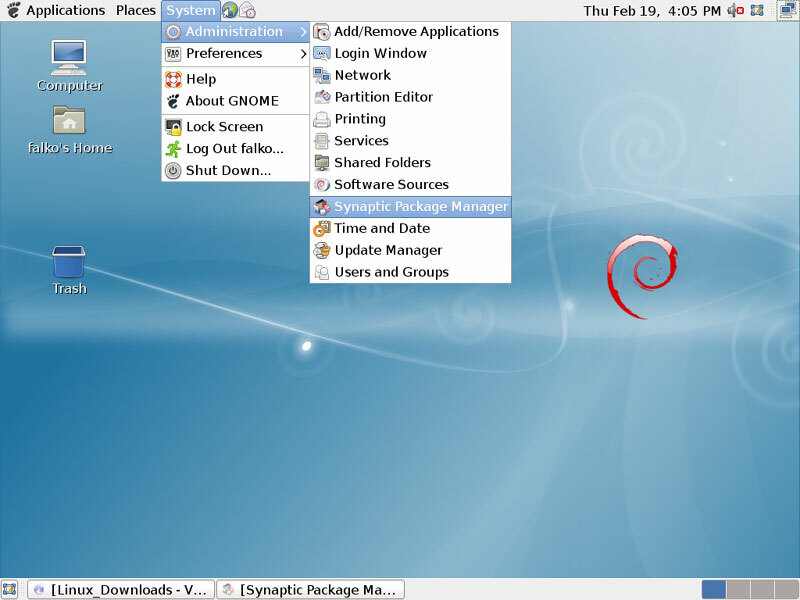 You need the oracle key and the repository is no longer non-free (but contrib). Thanks a lot, Falko! 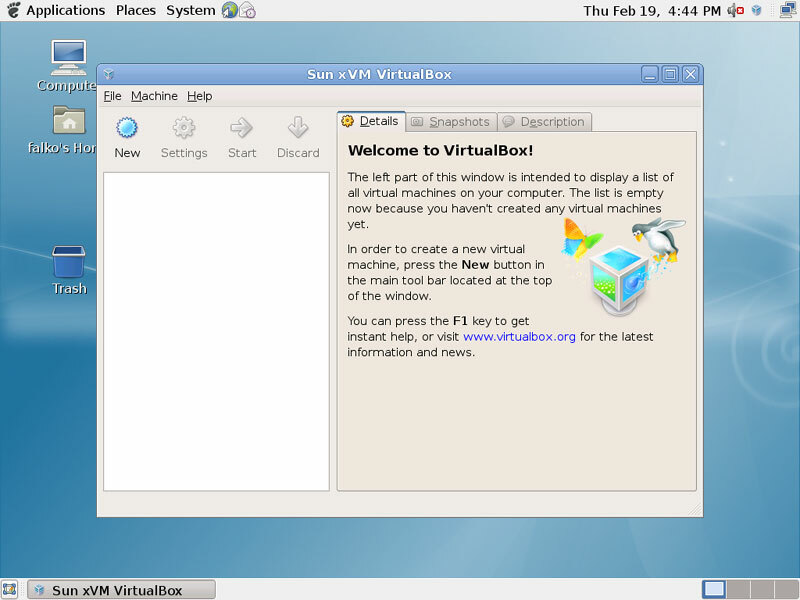 It worked out very easily to get VirtualBox up and running! Thanks for taking the time to make the tutorial.